Finding Nemo isn’t difficult. 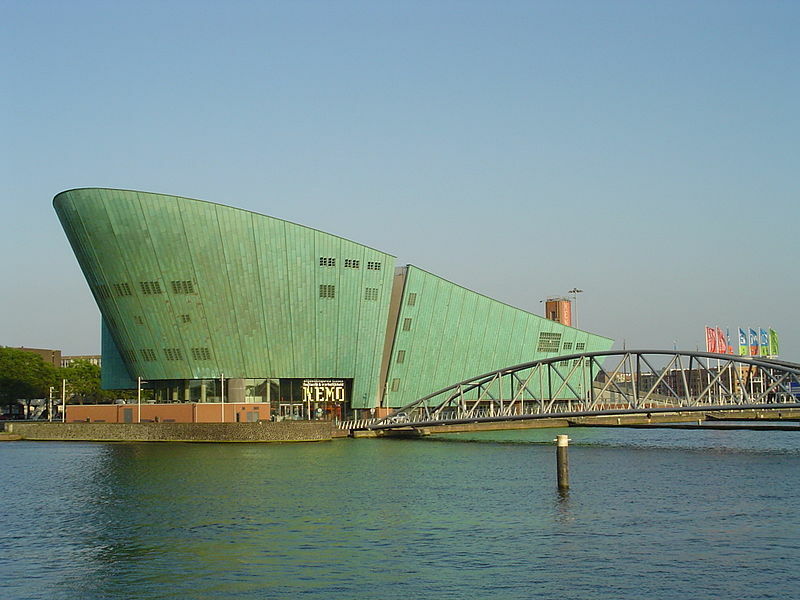 The science and technology museum has a prominent spot in Amsterdam, over the tunnel underneath the IJ*, the main water in the North of the city. The architect, Renzo Piano, built the structure to be an inversion of the tunnel below, but thanks to the green copper siding the structure also resembles a large cargo ship. In summer, you can sit on the upper deck (ie the roof) of Nemo and get a great view of the city. Even though I’ve been on the roof/deck, and I’ve been inside once for an award ceremony, I’ve never properly been to Nemo. Not in this shipshape building, anyway. In the 1950s the former Museum van den Arbeid (Museum of Labour) rebranded as NINT (Nederlands Instituut voor Nijverheid en Techniek – or the Dutch Institute for Labour and Technology) to put more emphasis on technology. The museum was based in a former school building until it moved to a former diamond factory in the 1980s. (Okay, it has always been in interesting locations…) I visited the museum here in the late eighties or early nineties, before it moved to its current ship in 1997. In the new location, the museum was briefly called “newMetropolis”, before rebranding as Nemo in 2000. The museum also has a lab, where kids can do experiments during their visit. Some of my friends worked there during university – it’s a great opportunity for university students interested in science outreach! It’s actually kind of ridiculous that I haven’t properly visited the museum. I keep meaning to, but every time I’m in Amsterdam I just end up catching up with friends and family. Next time we’re going to Nemo! * “ij” is one letter in Dutch. It takes the place of the “y” in the alphabet and is always a vowel, pronounced sort of like “eye” or “eh”. Because it’s considered one letter, when it’s capitalized, like in the name of the water that is just that one letter, both the I and the J are capitalized. Look, I’m sorry. It’s the only truly weird thing in the Dutch language and I was hoping I would never have to discuss it. Anyway, stop reading this footnote and go back up to read about the museum.